It has long been recognized that royal jelly is an effective hormonal tonic. Many have written in to us telling of their success using royal jelly in getting pregnant or balancing out menopausal or PMS symptoms. Previously done animal studies have shown that Royal Jelly can increase the production of testosterone. Now we know this to be true in humans as well with a study being done at Thi-Qar College of Medicine in Iraq. The study was done in 2007 and enlisted 83 infertile men who wanted to have children. The researchers divided the men into four groups who all took 10 grams of honey before going to sleep at night. The first group used honey containing 100 mg Royal Jelly. The second group used honey with 50 mg Royal Jelly, and the amount for the third group was 25 mg. It is important to note how little Royal Jelly the test subjects ingested - 100 mg is not very much royal jelly at all. The fourth group used honey without Royal Jelly. The supplementation lasted for 3 months. The study does not mention which sort of Royal Jelly was used - was it fresh, freeze dried or frozen? Although the men did not produce more spermatozoa as a result of the supplement, the Royal Jelly did increase the activity of the spermatozoa. Royal Jelly increased the concentration of testosterone by 20 percent. Twenty percent may not seem like much, but you only need 25 mg Royal Jelly a day to realize this effect. Taking more royal jelly to obtain a greater effect is not advised. 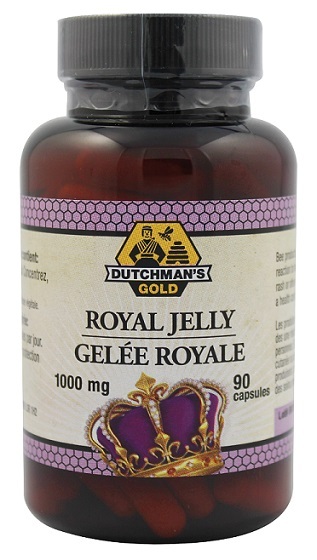 Studies have shown taking extremely large doses of royal jelly can have negative effects on hormones. The full study can be found in the journal of Food Chemistry and Toxicology, 2012 Jun;50(6):1834-40.